Quite why the province of La Rioja and its most famous wine take their names from the River – Rio in Spanish – Oja is something of a mystery. This so-called river is actually little more than a stream, rising in the Sierra de la Demanda and flowing north until it joins the River Tirón, in turn meeting the River Ebro near Haro. Native tribes were making wine here long before the Romans invaded in the first century and winemaking has continued unabated to this day. It even survived the Moorish conquest thanks to its importance to the local economy. However, ancient winemaking techniques also persisted and it was not until the mid nineteenth century that this began to change. Two landowners, the then untitled Marqués de Murrieta and the Marqués de Riscal, independently visited Bordeaux and studied how wine was made there before returning to Rioja with their newly acquired Bordelaise equipment and expertise. Possibly the greatest advance made as a result was the use of well-coopered casks to transport the wine; not only were they infinitely more practical than the animal skins used at that time, but it was also found that the wine was much improved after its sojourn in wood. Despite local resistance to what were considered to be unnecessarily expensive methods, the export market for Rioja blossomed and there was to be no going back. When phylloxera struck French vineyards in the latter half of the nineteenth century, this serendipitously timed transformation of Riojan winemaking meant that the region was producing wines very similar to those of Bordeaux at very appealing prices. Exports to France boomed and the classic “burnished oak” style of Rioja evolved as a consequence of French tastes. As far back as 1560, Rioja had established rules and regulations to govern the treatment of grapes, musts and wines. In 1635, the mayor of Logroño, La Rioja’s capital city, banned traffic from using streets alongside bodegas to prevent vibrations from disturbing the maturing wines. By 1787, many of the region’s leading growers had come together to establish the Real Sociedad Económica de Cosecheros de la Rioja Castellana (the Royal Economic Society of Castilian Rioja Producers) and their interests were further protected in 1902, when a national law was passed to guarantee the name of Rioja wine, its origin and its labelling. Rioja established Spain’s first Consejo Regulador (control board) in 1926, paving the way for it to become the first Spanish wine to obtain Denominación de Origen (DO) status when the system was introduced in 1932. In 1991, Rioja was the first region to be promoted to the prestigious Denominación de Origen Calificada (DOCa) status, thanks to its long record of consistently high quality wine production. Situated in the centre of northern Spain, approximately 100km south of Bilbao, the Rioja wine region is nestled between Sierra de Cantabria and Sierra de la Demanda, sheltered from the coolest influences of the Atlantic to the north and from the heat of the Mediterranean summers to the south. Rioja is unusual in that it straddles three different autonomous provinces: Álava in the Basque Country to the north and west of the River Ebro, Navarra to the north and east of the river and La Rioja itself to the south of the river. In winemaking terms, Rioja is divided into three distinct sub regions, each of which has its own characteristics. Rioja Alavesa, in Álava, is the smallest of the three and is bounded by the foothills of the Cantabrian Mountains to the north and by the River Ebro to the south. The mountains shelter the area from the worst of the Atlantic weather and, along with the warm Mediterranean influence from the south, help to create a temperate microclimate. However, the average annual rainfall is still double that of Rioja Baja. The soils of Alavesa are mostly calcerous clay and many of the vineyards are planted on terraces in small plots. Around 80% of plantings are Tempranillo, but all of the main indigenous red and white grape varieties are grown. Tempranillo ripens with a thinner skin here and although its wines are well suited to barrel ageing, carbonic maceration is also used to make a fruitier style of wine ideal for earlier drinking. Sitting mainly on the south bank of the Ebro opposite Rioja Alavesa, Rioja Alta stretches from the westernmost edge of the appellation to Logroño. The climate is predominantly Atlantic influenced and the soils are patches of calcerous (chalk-rich) clay, ferruginous (iron-rich) clay and pebbly alluvial sediment. The temperature is marginally warmer than in Alavesa, resulting in thicker-skinned Tempranillo and rather more structured wines. Mazuelo and Graciano are also grown and they are important constituents of top quality, ageworthy Riojas. 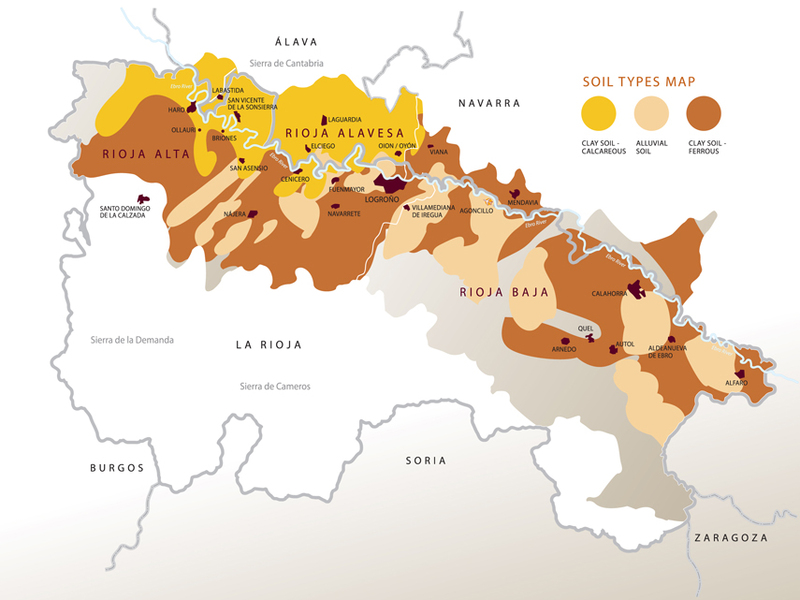 Rioja Baja is the largest of the sub regions and it accounts for 40% of Rioja’s wine production. It extends south-eastwards from Logroño to Alfaro, with most of its vineyards lying south of the Ebro. Unlike Alavesa and Alta, the climate of Rioja Baja is Mediterranean influenced and it experiences warm, dry summers. The landscape is flatter here and the vineyards are planted at lower altitudes on alluvial and ferruginous clay soils; there is very little chalk. Garnacha is the most widely planted variety as it is better suited to Baja’s longer, hotter ripening season. Young vines give fruity, aromatic, early maturing wines, whereas older vines produce more complex wines that age extremely well. - Tempranillo: the “little early one” is considered native to Rioja and it is the region’s premier red grape, making up the majority of the blend for most red wines and accounting for over 75% of total vineyard plantings. Depending upon where it is grown and how it is vinified, it produces soft, supple wines with aromas of soft, red summer fruits ideal for early drinking or complex, balanced, ageworthy wines that become velvety textured with time. - Garnacha: another native Spanish variety, known as Grenache elsewhere. Hardy and drought resistant, it offers good levels of extract and alcohol and its richness and spice neatly complement Tempranillo in a blend. From cooler sites, it makes excellent rosé. - Graciano: indigenous to Rioja, this small, tough skinned and difficult to grow variety has made something of a comeback lately thanks to its elegant freshness, aroma and longevity. Monovarietal versions are also becoming popular. - Mazuelo: also known as Cariñena or Carignan, this originated in Aragón but has been used in Rioja for centuries. Now only accounting for about 3% of plantings, it is still valued for the colour, acidity and tannins it contributes to a blend. - Maturana Tinta: an ancient variety, unique to Rioja, which was almost extinct until recently. Its resurrection was thanks to its deep colour, elegant acidity and spicy, balsamic character. These five varieties must make up a minimum of 85% of the blend (95% if the grapes are destemmed) and the balance can be made up with experimental varieties such as the dismayingly ubiquitous Cabernet Sauvignon. Rosé wines must be made from a minimum of 25% of red grapes. - Viura: better known as Macabéo across Spain, this is Rioja’s principal white grape. It offers fruity wines with floral aromas and remarkable acidity, making it ideal for both earlier drinking and aged styles of wine. Clean, fresh, zesty and lightly herbaceous when young it also responds well to oak ageing, developing complex, smokey nuances. - Malvasía de Rioja: an entirely different variety from the Malvasia grown elsewhere in the world. Its savoury character blends perfectly with the crispness of Viura and the vanilla richness of oak. - Garnacha Blanca: probably a natural mutation of red Garnacha, this shares many of the same qualities. Used in small amounts to add weight and body to Viura, some monovarietal wines are made. Grapes from very old vines produce exceptionally concentrated wines. - Tempranillo Blanco: another natural mutation of a red variety and another variety unique to Rioja. Becoming increasingly popular as a blending component, it provides citrus, tropical fruit and banana flavours. - Maturana Blanca: apparently Rioja’s oldest known variety, it provides high acidity and herbal, apple and citrus notes to a blend. - Turruntés de Rioja: not be confused with the Galician variety Torrontés or with the variety of the same name grown in Argentina. It is low in alcohol and high in acidity, its light palate displays fruity aromas with dominating notes of apples, plus a vegetal, grassy nature. Viura must be a minimum of 51% of the final blend of a white Rioja. Since 2007, in an effort to improve the competitiveness of Rioja’s white wines in the global marketplace, the use of Chardonnay, Sauvignon Blanc and Verdejo has also been permitted but they can only account for a combined 49% of the blend. One of the factors that make Rioja such a world-class wine is its ability to age. Not only that, but the higher quality wines often are not released for sale until after they have experienced a prolonged period of cask and bottle maturation. Spanish wines are often labelled according to the length of ageing they have received, a concept pioneered in Rioja and still used today. The same categories are used for red, white and rosé wines, although the minimum ageing requirements for reds are longer than for the other colours. Cosecha (“vintage”) wines are released at less than 15 months old, typically with little or no oak ageing to retain their youthful fruitiness. They are simply labelled as Rioja and carry no age statement other than their vintage. This is the same for all three colours of Rioja. The other categories are as follows. White and rosé Crianza wines can be aged in non-oxidative environments, such as stainless steel, to preserve their fruit character, but all other designations must be matured in 225 litre oak barricas before bottling. Sadly, very few producers still offer white and rosé Rioja in the Reserva and Gran Reserva categories. Although this is not a qualitative categorisation, it makes sense that only the best grapes are used for the wines that will be aged for the longest periods. Gran Reserva wines will only be made in the very best vintages and can often be ten or more years old when released for sale. Subject to the DOCa rules for the specific colour of wine being made, red or white grape varieties from any of the three sub regions can be blended as desired for any of the age designations, and this flexibility allows bodegas to develop their own distinctive house style. Basques like their wines to be light fruity and made purely from Tempranillo; Riojanos prefer the structure and maturity of the traditional mix of grapes, and Navarros enjoy rich, ripe Garnacha. All are classic Rioja. The style of winemaking in Rioja has remained virtually unchanged from the model created by Murrieta and Riscal in the 1850s and 60s, and these traditional wines are distinguished by their long periods of ageing in American oak barricas. Marques de Caceres pioneered a modern style of Rioja in 1970, a style that showcases the fruit and the freshness of Rioja by keeping oak ageing periods to their legal minimum and by using the rather more restrained French oak for barricas to lighten the influence of the wood upon the wine. To confuse matters yet further, a so-called post-modern school of winemaking emerged in the 1990s, spearheaded by producers such as Finca Allende, concentrating upon making wines from old vines or from specific vineyards to accentuate the expression of the terroir and upon using larger proportions of the historic, less common grape varieties in their blends to increase the harmony and complexity of their wines. They also combine the best aspects of both traditional and modern winemaking practices to produce wines that they feel perfectly encapsulate Rioja. The guys at Hanging Ditch asked to me present a selection of wines to illustrate the various styles of Rioja, and it made sense to focus upon their long-standing favourite producer: Bodegas Navajas. Because the Navajas family produces a wide spectrum of wines, we could easily highlight the differences between the various ageing categories within the framework of a consistent house style and quality. A cheeky little apéritif and a category-bending Reserva were added for good measure. The grandsons of founder Juan Leza Arenzana run this estate today, upholding his legacy of taking great care and pride in every stage of making their wines. They cultivate their own vineyards in the Najerilla valley in the heart of Rioja Alta. Delicately pale sunset pink, with a light yet perfumed floral, raspberry and wild strawberry nose. Dry and refreshingly crisp, surprisingly aromatic, with bright floral and raspberry flavours that lingered on the long finish. Summer in a glass. Lovely. Bodegas Navajas is a family owned winery based in the village of Navarette, some five miles west of the regional capital of Logroño. It was founded in 1918 as Bodegas Arjona, with the Navajas family only becoming involved in 1978. Five years later they purchased the estate and renamed it eponymously. What sets Navajas apart from many of the industrially scaled wine producers in Rioja is its attention to detail at every stage of the process, from monitoring conditions in the 150 hectares of their growers’ vineyards in Rioja Alta and Rioja Baja to hand-harvesting grapes and vinifying them in a new state-of-the-art winery. Wines are fermented in temperature controlled, stainless steel tanks before being transferred into French and American oak barrels. An unusually high quality cosecha, this is actually halfway towards being a crianza as the wine spends four months in oak. As a result, it displayed none of the rusticity that can sometimes afflict this youthful style of Rioja. A bright, cherry and red berry nose had a whiff of smokiness to it. Similarly vibrant cherry and berry fruit on the palate with a touch of gently smokey and coffee scented oak richness countered by lively acidity. A slightly darker fruit character on the nose and the palate than the Cosecha, as one might have expected of a wine that was three years older and that had spent at least eight more months in oak. Rounder and a little more tannic, but the acidity was rather less prevalent. A pleasingly long finish and really very good, especially for the price. The combination of an element of the bright, fruity character of a Crianza with a degree of the savoury maturity of a Gran Reserva makes the Reserva category of red Rioja a perennial favourite of many people. This category of Rioja also highlights the variety of winemaking styles used in the region, with traditional producers ageing their wines well beyond the minimum requirements and more innovative producers using this category for their flagship wines. They forgo the additional maturation and mellow oakiness of a Gran Reserva in favour of darker fruit and firmer tannic structure. This Navajas Reserva is a more modern style, whereas the La Rioja Alta Reserva below is a traditional as it comes. Soft, ripe, alluring nose of blackberry fruit and oak spiciness, with a darker blackcurrant thread running through it. The supple and velvety textured palate showed the same deep, dark berry fruit with well-integrated vanilla and gently toasted oak flavours. Mouthfilling and very long, this was ready to drink but would certainly keep for several years. Its richness and complexity, its balance of fruit and oak and the approachability it had gained from five years of ageing made this the wine that a lot of people voted as being their favourite of the flight of Navajas reds and I have to admit that I also preferred it to the Gran Reserva on the day. This was obviously a different kettle of fish from the outset. Much more savoury and coffee scented on the nose, with aromas of tobacco and oak spice wrapped around ripe black and red fruit. Although certainly showing a degree of evolution, this was well structured and actually still rather young. The roasted coffee and smokey notes of the oak had integrated nicely with the rich blackberry fruit and there was a slightly herbal aspect to the long finish. A little tighter than the Reserva, another two or three years would have seen this wine open out and reveal its full potential. On 10th July, 1890, five Riojan and Basque families who shared a dream to make and age top quality Rioja founded the Sociedad Vinícola de la Rioja Alta in Haro’s Station Quarter. In 1904, Don Alfredo Ardanza, one of the founders of La Rioja Alta and owner of the Ardanza winery, proposed a merger of the two companies. The name Viña Ardanza, now the estate’s most famous wine, was registered in 1942. One of the best known and highest quality producers of traditional style Rioja, no corners are cut in the pursuit of excellence at La Rioja Alta. The estate owns over 400 hectares of vineyards to ensure the finest quality grapes, it has its own cooperage to make all of its American oak barrels on site and every six months every barrel is manually racked by candlelight to remove sediment and to enhance the wine’s development. Viña Ardanza is a blend of Tempranillo and Garnacha. The Tempranillo grapes come from 30-year-old plots located in Fuenmayor and Cenicero. The Garnacha grapes come from ancient vines planted at an altitude of 600m in Tudelilla, Rioja Baja. The grapes were selected in the vineyard and taken to the winery in refrigerated trucks. Once fermented, the wines were transferred to traditional American oak barrels in May 2006. The Tempranillo was barrel-aged for 36 months in four and a half year-old casks. The Garnacha was aged for 30 months in two and three year-old casks. The wines were manually racked six times before being blended and bottled in July 2009. Although this was a Reserva, its long ageing period meant that we thought it would be more interesting and more appropriate to compare it with the newer style Navajas Gran Reserva as they were both from the same vintage. Infinitely more funky/leathery/meaty/farmyardy on the nose than any of the other wines we tasted, I loved this from the outset. It had a brighter, almost Burgundian, red fruit character than the Gran Reserva above, with juicy acidity and a suggestion of dried orange peel on the velvety palate. Whereas the Navajas had a reasonable percentage of firmly structured, dark fruited Graciano and Mazuelo blended with its Tempranillo, this had a similar amount of fuller, softer, red fruited Garnacha instead, which might well count for some of the stylistic difference. In true Rioja fashion this was as much about oak as it was about grapes. I was quite surprised that so many people enjoyed this as much as I did given its distinctive characteristics, but it ended up edging out the Navajas Reserva from the top spot of the evening. Even a lady who disliked this intensely upon her first sip had a Damascene moment when she re-tasted it whilst eating a piece of Manchego. After the Viña Ardanza, we paused the proceedings for some Spanish-inspired nibbles to demonstrate just how food friendly red Rioja is. Although it might seem rather counter-intuitive to pour a white and a rosé after a series of red wines, these were both Crianzas and had spent more time in oak than the Cosecha red poured after the initial rosé. If we had served these before the first red wine, their oakiness would have affected everyone’s perception of the lighter style Cosecha. A smokey vanilla oak, pithy citrus and wild herb nose carried through onto the palate. Lemon and grapefruit fruit, elegant use of new French and American oak and a long, lightly herb infused finish. Very good indeed. Aside from Rioja, the only other region I could think of that offers oaked and aged rosés was Champagne - even though the method of production differs. 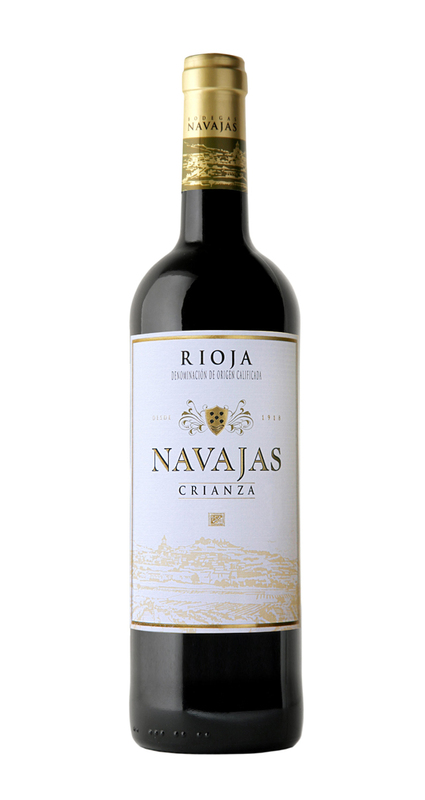 Many estates have completely eschewed cask and bottle aged styles of rosé, especially the Reserva and Gran Reserva categories, but Navajas still offers this Crianza and I was keen to give people the chance to try something quite so idiosyncratic. More salmon hued than the previous rosé, with delicate red berry fruit and spiced vanilla oak on the nose. The palate displayed similar flavours that moved into a long, oaky finish with a gently tart redcurrant fruit character. The half and half red and white grape blend was more than sturdy enough to hold its own against the American oak and, although this was a wine that shouldn’t work in theory, it over delivered in practice. A wine that celebrated all of the joy that traditional styles of Rioja evoke. As with rosé Champagne, this was an incredibly versatile and food friendly wine that could be paired with a wide range of dishes from Spanish to Middle Eastern to Asian, and it would work equally well with fish, shellfish, poultry game and white meats. It was also universally enjoyed. Given the unstoppable rise in popularity of rosé over the last five or six years, it seems a real shame that Rioja has all but abandoned its unique and delicious styles of these wines. I began the tasting by asking everyone what the word “Rioja” meant to them and most answered with variations upon the phrase “A Spanish red wine”. Hopefully they all went away with an appreciation that not only does the Rioja region offer four different red wines in a wide range of styles, it produces a correspondingly diverse range of white and rosé wines, too. If that wasn’t enough, Rioja is also one of the last bastions of aged wines that are widely available at prices that don’t only appeal to extravagant oligarchs. These are wines to treasure and they are wines that will continue to provide pleasure over many years.